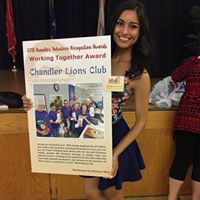 Home→Club News→Chandler Lions 2nd Vice President Crowned Miss Arizona! ← Has your club helped to support the Lions Sight & Hearing Foundation (now known as Arizona Lions Vision & Hearing Foundation)? Chandler Lions 2nd Vice President Isabel Ticlo was crowned Miss Arizona at the end of June! The Chandler Lions couldn’t be prouder. Lion Isabel is a very dedicated young woman, just as beautiful on the inside as she obviously is on the outside. She began her Chandler Lion venture as a Hamilton High School Leo and after graduation continued through the Leo to Lion program. In 2017, she was awarded our highest compliment with a Melvin Jones Award. The 2018-2019 term will mark Miss Isabel Ticlo’s, Miss Arizona’s!, 10th year as a Chandler Lion. 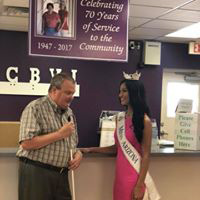 She will represent our state at Miss America this September as the first Miss Arizona with a Bollywood Dance for the talent portion of the competition. She will also represent all Lions with her platform: Supporting Those with Vision Impairment. Lion Miss Arizona Isabel showing off the Chandler Lions Club’s City of Chandler Working Together Award poster.